From a humble beginning of just 6 workers and 1 printing press, we began to grow and increase our product offerings to include self adhesive stickers, heat transfer labels and name plates which are commonly used in packaging and display. Besides investing heavily in state-of-art technologies such as high tech pre-press, advance printing presses and post-press inspection system, we have also invested in human capital. Today our workforce is a 150 strong and experienced personnel dedicated to providing solutions to our customers. The trusted platform for growth. Care for customer, environment, people and investor. Respect humanity! Make Mega Label a platform for everyone to grow. Commitment to be the leader in the industry to reduce environmental impact of packaging. Deliver great value in terms of Quality, Delivery, Idea & Price. Able to adopt, adapt, exploit and create value in response to change and evolution. We believe in speed as the key to competition. We strive to improve turnaround time with better flow and processing. The best or nothing. Excellence is an attitude of looking at our jobs in every details. Executing task with care, perfecting our self and our product endlessly. Success and failure are determined by details of plan and execution. 30 years of innovation to ensure client’s satisfaction in the most efficient way. PCCS directors foresaw opportunities in the label market and were inspired to venture into the label industry. Mega Enterprise was then established with a humble beginning of only 1 letterpress printing machine and 6 workers. It was located in a shop unit. From then Mega Enterprise grew from strength to strength and was later re-registered as Mega Labels Sdn. Bhd. in 1989 and remained as such until today. Moved to light industrial park. 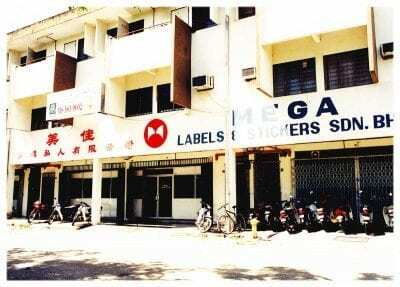 Mega Labels moved ahead with small achievement steps and was primed for potential development & growth in its industry. One step ahead in the southern region to pursue the acclaimed certification and was officially certified rendering Mega Labels to be well known within the manufacturing industries. Mega Labels continual growth prompted the company to relocate to a bigger site in order to stay competitive and remain within the top 10 key label printers in the industry. Again Mega Labels was one step ahead of its competitors by installing the 1st rotary press in Malaysia. The same year saw Mega Labels leading the industry by installing the 1st Mac system providing the company another breakthrough in the label industry. Acknowledging the company’s remarkable achievement, Malaysia Commonwealth Committee officially granted Mega Labelsto be the official licensee for label & stickers for the XVI Commonwealth Games in Malaysia. It was another major step for Mega Labels to set up its 1st manufacturing site outside the southern region to better serve customers in the central and northern region. Mega Labels certification by UL /CSA for its indirect export of labels on customer’s products to the US and Canadian market recognizes the company’s quality standards. Mega Labels took a small step out of Malaysia but one giant leap into blow molding business, beyond labels printing tradition; the strategy is to provide a one-stop “Total Packaging Solution” to its customers and to diversify its business. Repackaging itself to better align its business with concept of future development, modernization of factory set-up by implementation of quality management system such as ISO9000, ISO14000, GMP certification (Good Manufacturing Practices), SFDA (State Food and Drug Administration), Clean Room standard and etc. In recognition of the company’s outstanding achievements and great efforts of local enterprises that contributed to the local economic growth. Nomination criteria includes the enterprise’s achievement on social responsibility and ethics in management, managing Innovation and Change, managing future challenges and threats, sustainable growth and successor development plan. Installed the first Flexo press. Welcome to the new era of Mega Labels’ Flexographic System and the remarkable print quality it delivers. Its quality is comparable to offset and rivals gravure, raising print quality and productivity to new heights. CTP (Computer to Plate) avoids potential losses in quality that may occur during film processing, including scratches in the film, and variations in the exposure. Plates produced are more consistent and with lower wastages. CTP also improve registration and image repeatability over traditional methods. Won Best of Show at AFTA (Australia) Award. To win a print competition is tough but to win repeatedly is definitely not by luck. To print labels and sticker is just another job but to produce a good piece of high quality decorated stickers is an Art! Mega Labels is being recognized not just once but consecutively in the following years. Won Best of Show at Asian Label Award. Again, another recognition in management excellence! With ever demanding market for faster lead time and also shorter run length, Mega Label moved to digital printing. The WS6000 is capable of high resolution image, VDP (Variable Data Printing), high speed printing and low setup time. Moved to a new Selangor Plant. Increase production capability and capacity to cope with increasing market demand, delivery and short lead time. This is one step forward toward our regional supply objective. Won Silver and Bronze awards at AFTA . First regional eco friendly building in Cambodia. In view of our determination for regional presence, Mega Labels has set up another out-of-Malaysia factory. This is also in align with the growing demand for textile labels and regional customer request for localization, which increases our competitive edge. As it has always been Mega motto of being eco friendly, this new factory is build with some latest environmental friendly features which will significantly reduces world carbon footprint. Appointed by French largest sports retailer to supply printed fabric labels and heat transfer. Increasing of market demand, we invested another one flexographic system. Appointed by one of the world’s leading brand to supply heat transfer label. Increasing of market demand, we invested another one Digital press. Award bestow by Asian Label Association to recognise our printing excellence across Asia. During our 30th years in business, we were recognized by our customers as well as our supplies for printing excellence.